Let’s be honest, we all struggle with charging what we’re worth. We know that the work we do has real value, but how do we price our products and services accordingly without creating sticker shock and losing all our customers? Blair Enns is here to help. This special keynote presentation is in partnership with AAF Reno, AIGA, AMA, NCET, and PRSA and is graciously sponsored by Noble Studios. 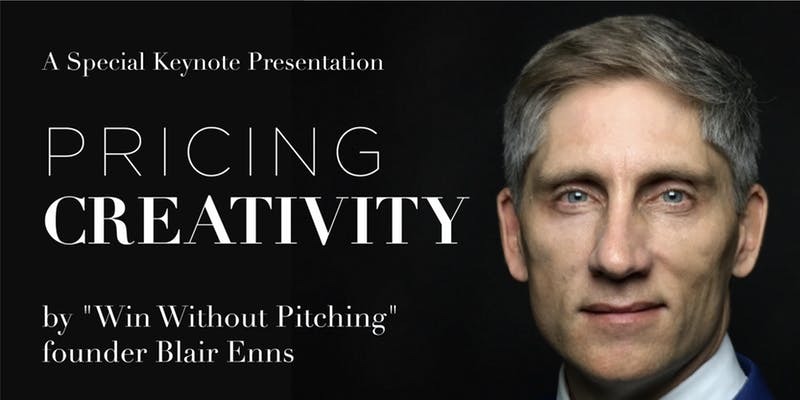 Author of the Win ​Without ​Pitching ​Manifesto, Blair ​Enns ​has ​a ​brand ​new ​book, Pricing ​Creativity: ​A ​Guide ​to ​Profit ​Beyond ​the ​BIllable ​Hour. ​He ​is devoting ​much ​of ​2018 ​to ​speeches ​and ​workshops ​on ​five ​continents ​in ​support ​of his ​objective ​to ​significantly ​improve ​the ​earnings ​of ​creative ​professionals everywhere. “It’s ​my ​goal ​to ​increase ​the ​profits ​of ​the ​world’s ​independent ​creative ​firms by ​more ​than ​$100,000,000 ​a ​year, ​and ​I’m ​confident Pricing ​Creativity ​will ​do ​that.” Enns ​believes ​that ​by ​applying ​his Pricing ​Creativity ​principles, ​rules ​and ​tips, ​the average ​firm ​should ​easily ​increase ​their ​profits ​by ​5% ​of ​their ​current ​revenue. ​For example, ​a ​firm ​doing ​$1m ​in ​revenue ​should ​be ​able ​to ​add ​a ​minimum ​$50k ​to their ​bottom ​line, ​with ​many ​adding ​much, ​much ​more. ​Some ​of ​Blair’s ​creative ​firm clients ​have ​increased ​revenue ​by ​more ​than ​50% ​through ​his ​techniques, simultaneously ​improving ​profit ​margin ​from ​4% ​to ​45% ​in ​just ​one ​year. Blair ​is an ​accomplished, ​and ​provocative ​speaker ​who ​strives ​to ​deliver ​a ​talk ​that ​leaves ​a wake ​of ​lively ​debate ​long ​after ​the ​event ​has ​ended. Blair ​Enns ​is ​on ​a ​mission ​to ​change ​the ​way ​creative services ​are ​bought ​and ​sold ​the ​world ​over. ​He ​is ​the founder ​and ​CEO ​of ​Win ​Without ​Pitching, ​the ​sales training ​and ​coaching ​organization ​for ​creative professionals, ​and ​the ​author ​of ​two ​books ​on ​selling ​and pricing ​for ​creative ​professionals. ​He ​is ​the ​cohost, ​along with ​David ​C. ​Baker, ​of ​2Bobs, ​the ​podcast ​on ​creative entrepreneurship. Blair ​lives ​in ​Kaslo, ​British ​Columbia, ​Canada ​and lectures ​throughout ​the ​world. ​He ​has ​spoken ​to ​dozens ​of conferences ​and ​organizations ​on ​five ​continents. After-Luncheon Mixer – Meet Blair! Noble Studios will be hosting a select number of people at the Noble Studios office at 6pm following the luncheon on February 6th. There will be drinks, appetizers, and of course, Blair Enns himself. We have limited availability, so get your tickets fast! Early Bird tickets get entered into a raffle for one of 20 spots to go on a tour of the Tesla Gigafactory on February 7th! Buy your ticket early for your shot at the tour, and buy all of your friends tickets to increase your chances!